As a mother of two young children, shopping always involves a bag full of treats, usually quavers and chocolate buttons, a buggy, my kids and lots of yelling. As you can imagine, it can be a pretty stressful experience. 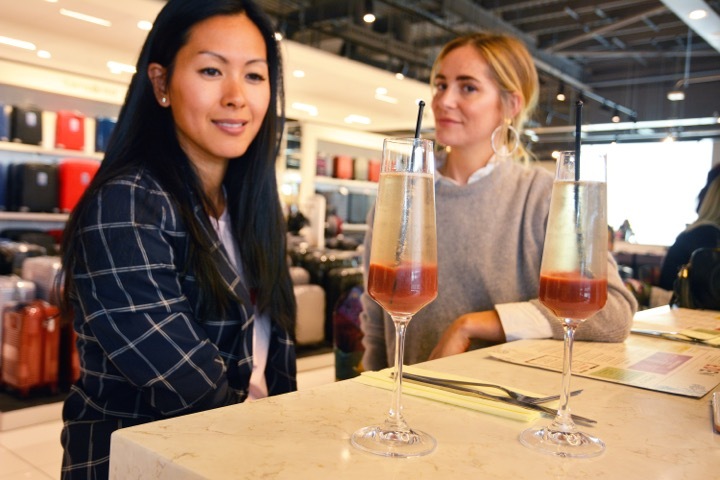 Bloggers Debbie and Katie visiting Eden champagne bar at Rushden Lakes on 30th May 2018. So, when I opened my email and saw a message that went something like this….’Hey Debbie, We would love to invite you up to Rushden Lakes for a spot of lunch and to do some shopping…with a girlfriend……!”, I replied ‘YES PLEASE!” in a heartbeat! And I knew who I wanted to come with me. My beautiful friend who has the same shopping energy as me, The Mum Life Styled, Katie. Bloggers Katie and Debbie visiting Robert Goddard at Rushden Lakes on 30th May 2018. Photos by John Robertson. Our journey to Rushden Lakes from Kent was pretty smooth. We chatted non-stop and before we knew it we had arrived! So, what did we think of Rushden Lakes on our arrival? I was impressed. It was nicely laid out and all the big high street stores I loved were there including Primark, Boots, River Island, Next, Marks and Spencer and H&M. My favourite of the high street stores was House of Fraser – it’s first new build in eight years, so I was keen to visit. Rushden Lakes is also home to a parade of more premium and independent shops including Joules, White Stuff, Jigsaw, Robert Goddard and Magazine Heaven. Now, let’s talk about Magazine Heaven – it’s so cool and the first of its kind. It’s full of every single magazine you could possibly think of! And there was one particular magazine I wanted, as sadly, it was the final issue – Look magazine. We also can’t forget it’s fantastic artisan café where we fueled ourselves with coffee and a croissant before we explored to discover Rushden Lakes is even more unique – set on a wildlife reserve with its very own lake and outdoor activities for the whole family. Bloggers Katie and Debbie visiting House of Fraser at Rushden Lakes on 30th May 2018. Photos by John Robertson. Our first shopping stop was House of Fraser – every fashion lover’s paradise. The décor was modern, stylish and had its very own ‘living wall’ to coordinate with the theme of Rushden Lakes. Katie headed straight to the MAC counter to freshen up her make-up before we headed to the second floor for the ladieswear. Bloggers Debbie and Katie visiting Magazine Heaven at Rushden Lakes on 30th May 2018, where Debbie discovers she features in ‘Look’ magazine. Photos by John Robertson. Black Luxe Cape Jacket – £90. Blue Printed Romantic Ruffle Dress – £99. White Tiered Lace Pleated Maxi Dress – £139. Hot Pink Tassel Side Stripe Trousers – £70. Yellow Arimi Crepe Tie Neck Dress – £130. Green Victoriana Jumpsuit – £120. Aimee Frill Panel Spot Dress – £75. Sophie Pleated Sport Skirt – £69. Loupe Sandals in White Croc – £80. Blogger Debbie visiting Jigsaw, Rushden Lakes on 30th May 2018. Photos by John Robertson. After a very successful shopping experience in House of Fraser, we treated ourselves to a spot of lunch at Eden, all washed down with a glass of prosecco to toast how much we love Rushden Lakes and #TheRushYouGet when shopping with a girlfriend. I’m an old school shopper who loves to go out shopping, try on the clothes, feel the fabrics, experience the stores, listen to the music and feel the vibes. For me that’s the joy. To be in the moment. #TheRushYouGet when you come away laden with bags! We couldn’t drive away from Rushden Lakes without giving an activity on the lake a try, so being ridiculously overdressed in the most inappropriate footwear, we decided to risk going peddling on the beautiful lake. Oh boy, did we laugh! And I know my kids would have thoroughly enjoy it! I have to say Rushden Lakes, you were an absolute blast! See you soon! I’ll be back!